Disclosure: This shop has been compensated by General Mills and The Coca-Cola Company. All opinions are mine alone. 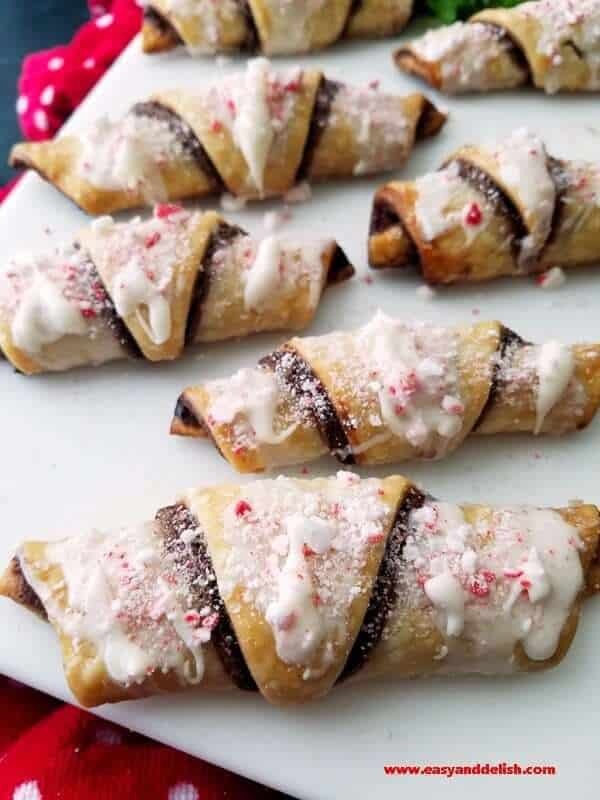 These 6-Ingredient Chocolate Hazelnut Spread Cookie Roll Ups with Peppermint Glaze are an easy holiday treat made in 30 minutes and perfect for entertaining. Christmas will arrive sooner than we think. 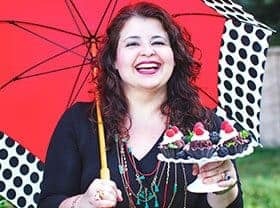 For my family (as for many others) the jolliest and busiest time of the year calls for holiday recipes that are both tasty and easy to put together– so that we all have time to go shopping and, most of all, to spend time with our loved ones. Right? These stress-free 6-Ingredient Chocolate Hazelnut Spread Cookie Roll Ups with Peppermint Glaze are fun, can be made in 30 minutes, and deliver the season’s most cheerful flavors — chocolate and peppermint of course. 😉 I got the inspiration from the Pillsbury site. They have great recipes to inspire holiday baking! Mini cans and Members Mark Yeast Dinner Rolls. Yes, Sam’s Club is the place to get all you need for your holiday entertaining at affordable prices, making it possible to pick everything up in just one shopping trip. A real time-saver! And time, my dears, is something that I personally struggle with, especially around the holidays. 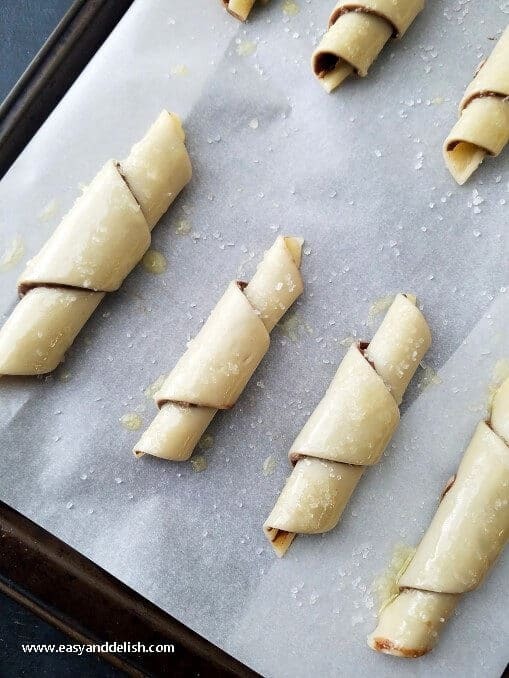 Saving time on shopping lets me get some extra moments to enjoy with my kids — especially time for baking all sorts of cherished family recipes and for trying new ones, like these Chocolate Hazelnut Spread Cookie Roll Ups. All of the memories, conversations, giggling, distinct aromas, and fun in decorating the baked goodies to add that special holiday touch… oh, and the smiles. The sheer joy of those moments of togetherness, which lasts a lifetime! All of those wonderful things leave their golden touch on the food, and our guests seem to enjoy them even more. It’s true that we are physically apart, dear reader! But nonetheless, you are invited to come on into our kitchen and enjoy this special treat. Above all, I hope that you consider sharing it all with your precious family and friends. Ready to learn how to prepare our yummy chocolate hazelnut spread cookie roll ups? Roll up each triangle into a crescent shape (start with the outside rim and roll in toward the center). Place on a large cookie sheet lined with parchment paper about 1 inch apart. It’s important to keep hands as clean as possible by not letting fingers touch hazelnut spread while rolling up crust triangles. Repeat with remaining pie crusts and chocolate hazelnut spread. Then, brush tops with melted butter. If desired, sprinkle sugar sprinkles. Bake for about 20 minutes or until golden brown. Remove from cookie sheets to cooling rack. Meanwhile, prepare the glaze. Whisk powdered sugar and heavy whipping cream together until mixture is smooth (no sugar lumps). 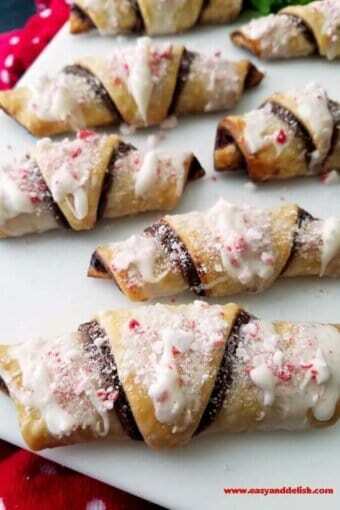 Drizzle over the warm chocolate hazelnut spread cookie roll up using a fork, and sprinkle on crushed peppermint candy. Let glaze set and the Chocolate Hazelnut Spread Cookie Roll Ups cool completely. Enjoy! 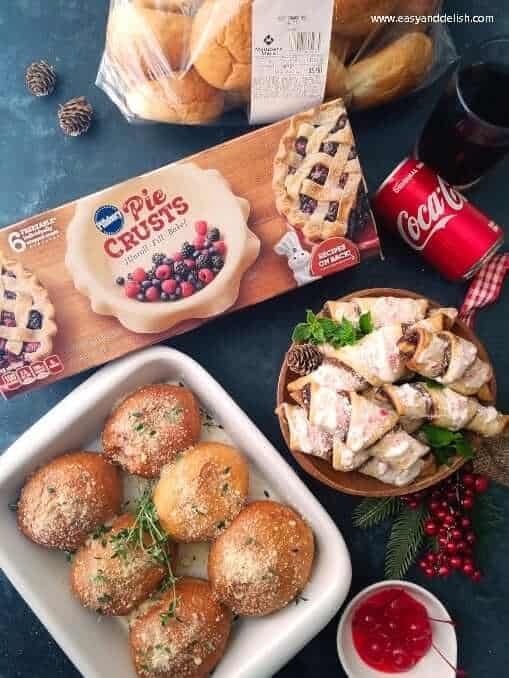 A great, time-saving method for easy holiday entertaining is to use the variety of General Mills’ products at Sam’s Club as a starting point that, with just a few simple tweaks, you can modify into other dishes and drinks. 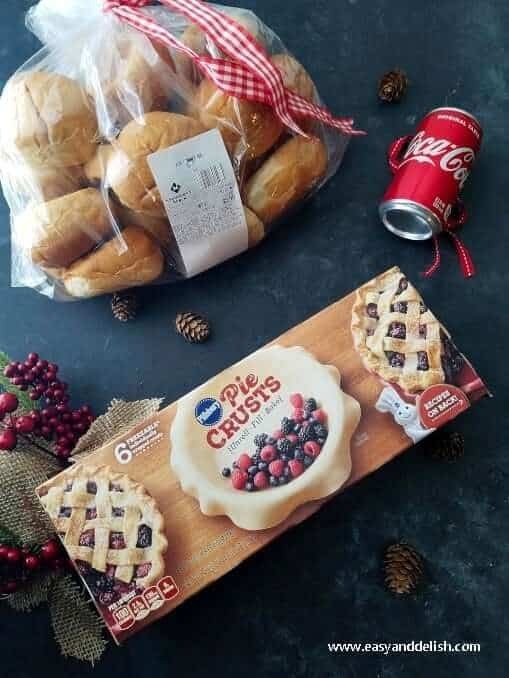 Members Mark Yeast Dinner Rolls and Coca-Cola® Mini cans are affordable pairings that can be enhanced into something new in a jiffy! Members Mark Yeast Dinner Rolls come in a 36-count bag. 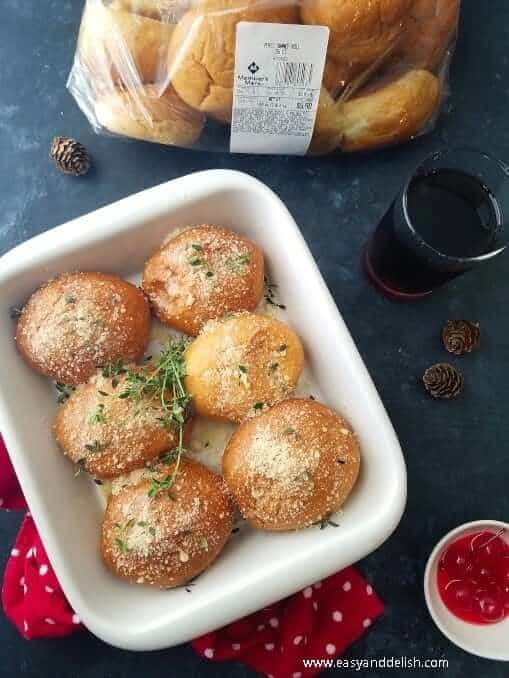 You can either use them to make savory sandwiches to pair with our sweet treats above, or you can transform them into Buttery Parm Rolls. For the latter, simply arrange rolls into a baking dish, brush melted butter on top, and sprinkle on grated Parmesan cheese. Then bake at 350 F for about 5-7 minutes. Remove from the oven, and sprinkle on fresh thyme or chopped parsley. Serve them either as is or along with various cold cuts, cheeses, and marinated olives on the side. Red salsa or flavorful tomato sauce also make a great dipping sauce for the baked rolls. Serve chilled as it is, or customize your own drink. I made a Roy Rogers Mocktail by adding ice, maraschino cherry, and grenadine syrup to Coca-Cola®. This is non-alcoholic drink named after the famous American singer and actor. We got you covered now, don’t we? Imagine having to cook a feast for a holiday party! I am telling you, clever and easy is the way to go! Make our no-fuss-entertaining dishes and drink, and you can take a huge weight off your shoulders and pain from your feet. Most of all, make entertaining fun, affordable, and tasty, without all the complication. Spend time with your family and make some amazing memories. Start by heating oven to 375°F. On a flat work surface, unroll 1 pie crust; spread a thin layer of hazelnut spread over crust. Roll up each triangle into crescent shape (start with the outside rim and roll in toward the center). Place on a large cookie sheet lined with parchment paper about 1 inch apart. 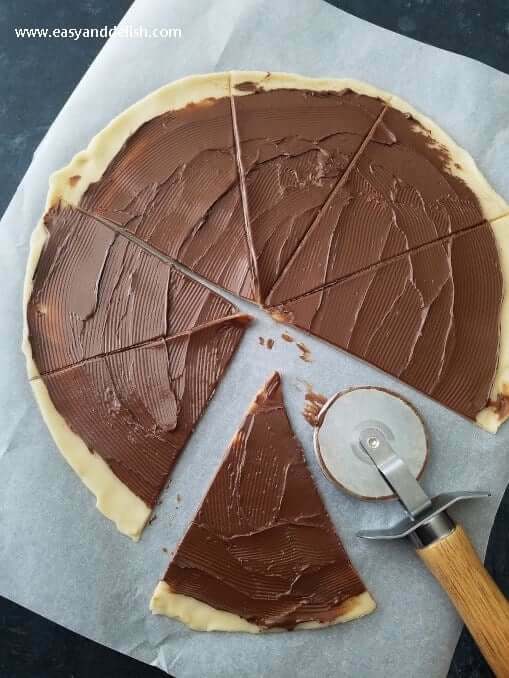 It's important to keep hands as clean as possible by not letting fingers touch chocolate hazelnut spread while rolling up crust triangles. Repeat with remaining pie crusts and hazelnut spread. Then, brush tops with melted butter. Bake for about 20 minutes or until golden brown. Remove from cookie sheets to cooling rack. Meanwhile, prepare the glaze by whisking powdered sugar and heavy whipping cream together until mixture is smooth (no sugar lumps). Drizzle over the warm Chocolate Hazelnut Spread Cookie Roll Up using a fork, and sprinkle on crushed peppermint candy. Let glaze set and Chocolate Hazelnut Spread Cookie Roll Ups cool completely. Enjoy! Storage: Store Chocolate Hazelnut Spread Cookie Roll Ups in a clean airtight container or plastic bags at room temperature for up to 3-4 days. 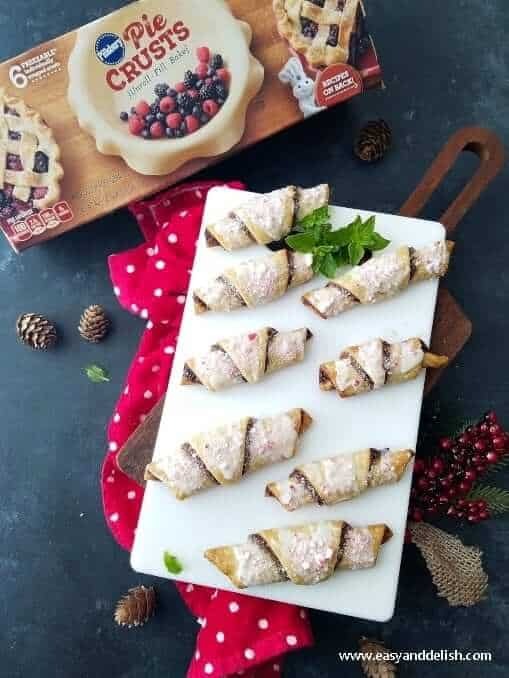 Love easy Holiday treats? Try our No Bake Chocolate Candy Cane Cheesecake Cookies . Thank you my friends! It’s a pity that peppermint is not available in Greece. It makes the recipe more interesting for sure. But spices like the mixture suggested by you would go well too. If you happen to have ground cardamom or chai powder in Greece, those would take the recipe to a whole new level. 😉 Wishing you both happy holidays! So good to see you here again. Missed you guys! We missed you too sweetie! Cardamom sounds amazing, and it’s one of our favorite spices! What an awesome idea, thank you! Wishing you and your family an amazing Holiday season! 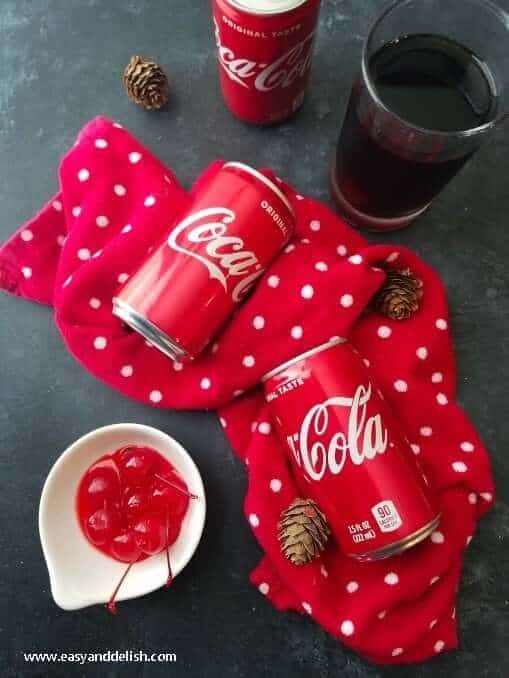 Christmas is closer than we think! Time saving recipes are life savers this time of year, thank you for a scrumptious one! Thank you. They are quite delicious and a different way to use pie crust. I hope you have the chance to make them and enjoy. Ooh these look like little croissants, so cute! And absolutely perfect for any Christmas dinner table 🙂 Thanks for the great idea Denise! Thank you! There were a hit! My husband and children loved them.